All the medieval castles of Ireland have certain castle features in common that I will be naming and introducing you to on this page. 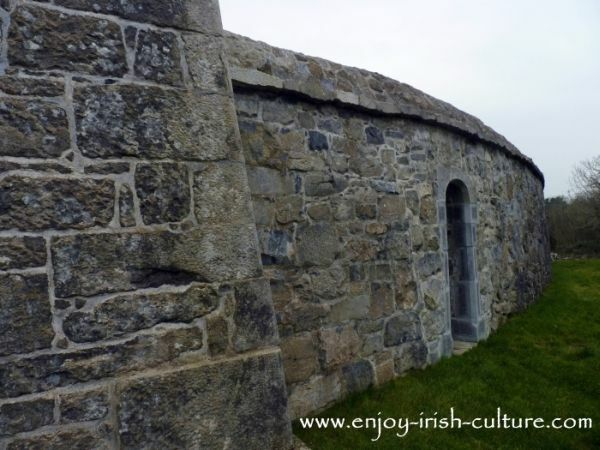 Start by watching the video of our castle visit to Annaghdown Castle! 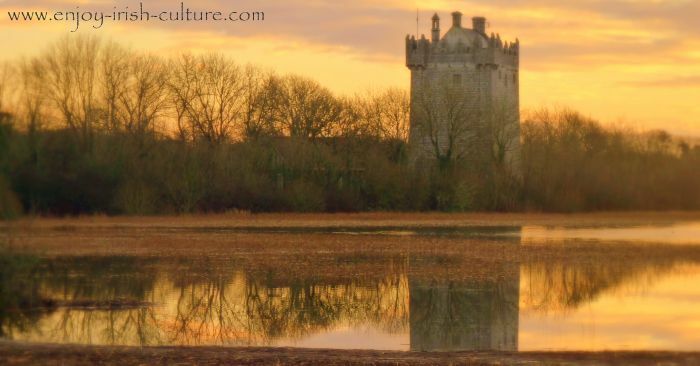 Castles started to be built in Ireland about a generation after the arrival of the Normans. The Normans were a multicultural bunch of fierce, but cultured warriors with superior technology to the Irish. Because they had conquered England and ruled there, they are often referred to as Anglo-Normans. In reality, English was not their mother tongue, and their kings were based in France, not England. They spoke a cocktail of languages, with Norman-French being the most dominant one here. The Normans brought the technology for building castles to Ireland. Some words for castle features on this page (and throughout the castle section) stem from Norman-French. 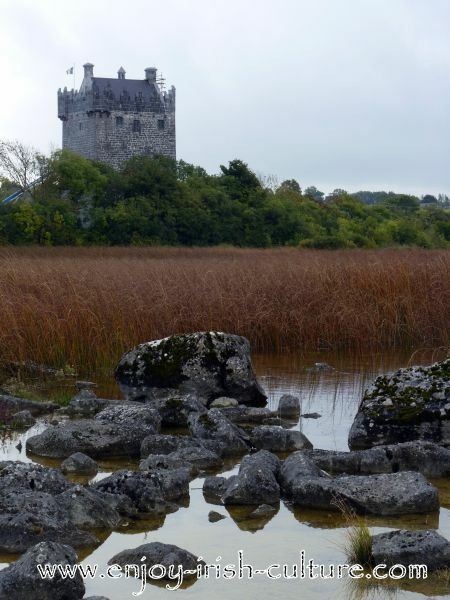 County Galway alone (where we live) has over 200 Tower House Castles. Most are in ruins of course. 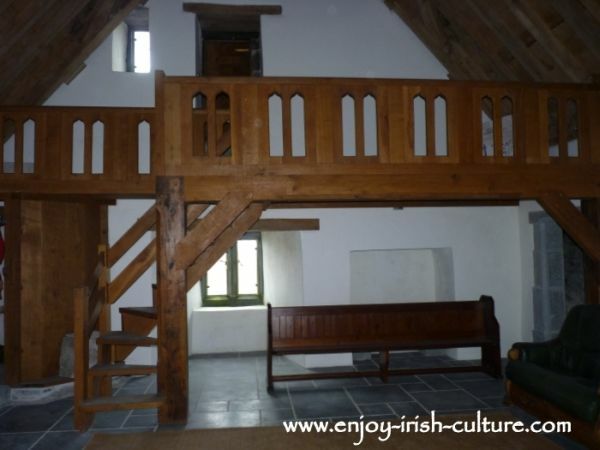 But, some of these Irish castles have been lovingly restored, for example Annaghdown Castle. The murdering hole- see it on the photo below taken at Craggaunowen Castle- a nasty welcome from above for anyone attempting to invade the castle. They would be exposed to a hole above them once they arrived in the tiny main entrance hallway. The murdering hole (or 'pol na mairbha' in Irish) was a place to launch hot oil or hot tar as well as rocks on your enemies’ heads from above! The chapel: Religion was extremely important to the Normans.The close connection with the church helped them cement their position of power in a society where they were outsiders and invaders to start with. At Annaghdown Castle, the families' quarters had a chapel beside it. 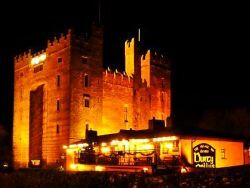 At Bunratty Castle, the grandest of all Tower Houses, there are two chapels, one public, one private, AND they had a resident priest! 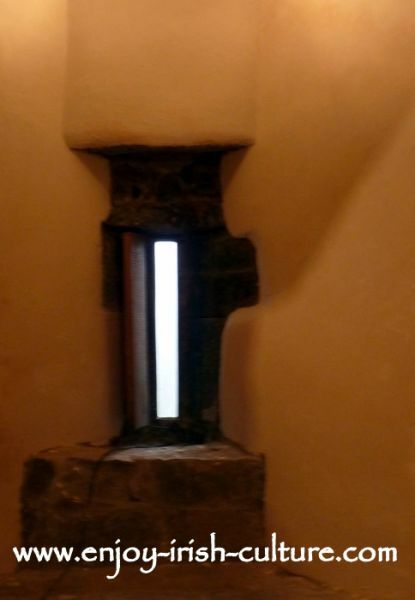 Ever wondered about what toilets they had at the medieval castles of Ireland ? They were called garderobes. Find out about them here! Oubliette- a polite French-Norman word meaning 'forget about it'... Hang on, forget about what exactly though? Oops, this is a really nasty feature- a medieval prison. The oubliette was a hidden room, windowless and without a door, perhaps featuring one or two very narrow loop windows that would make escape impossible and would let in just enough air for the prisoners to be able to breathe. 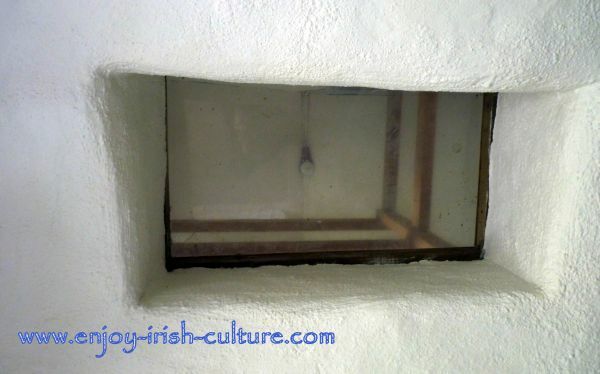 See the trap door to an oubliette at Cahir Castle, County Tipperary, on the photo below. The oubliette was the place for ‘political prisoners’ as in enemies, or indeed for anyone you didn’t like. The only way to access the oubliette was through a hole in the floor from above. So, literally, prisoners were thrown into this prison here and then forgotten about. They might pass down food and water the odd time, but there were no guarantees of that. Back then, nobody was campaigning for prisoners’ rights. The most gruesome oubliette story? Well, just for you. Because you asked. This happened in Scotland though, not in Ireland. A family imprisoned their daughter in the oubliette because she refused to marry whomever they had picked for her. They thought that surely she would give in after a day or two in the oubliette. But no, she didn't budge. Not after a couple of days, not after a week, not after two weeks...until eventually, she died in the oubliette. Gruesome times, for sure. 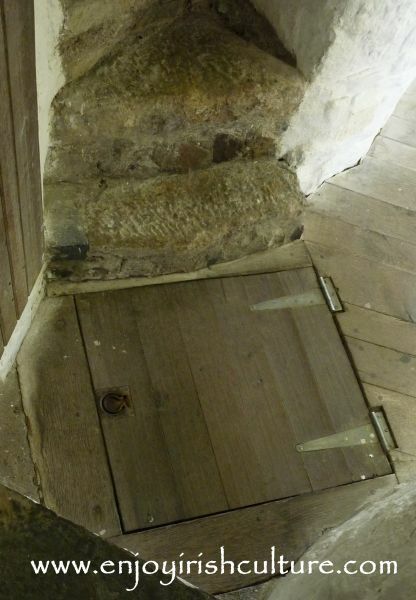 The trap door to the oubliette at Cahir Castle, County Tipperary- once regarded as one of the safest castles of Ireland. The great hall- located on the uppermost floor in most of the castles of Ireland, the great hall was a room with a tall cathedral ceiling often with a fireplace in the middle used for gatherings of any size, family based, clan based or bigger. It was a place for excessive feasting and merrymaking. The minstrels’ gallery in the great hall, see on the picture below, a raised timber gallery. High above the gathering was the place for entertainers, for the poet, the harper, for anyone giving speeches. Just as long as you remembered to say the right thing. The oubliette wasn't too far away. Loop windows- tall, narrow windows splaying towards the inside with a single straightforward function: to shoot arrows through while protecting the archer. For the medieval castles of Ireland this was an indispenible part of the defence system. Did you know that professional archers in medieval Ireland could shoot up to 11 arrows per minute? They trained from the age of seven. See a loop window designed for archers on the photo below. This window, located in a corner of the building, would allow two archers to shoot in tandem- while one drew, the other shot. Loop windows were letting in a lot of drafts. They were really quite impractical to live with. People used animal skin on wooden stretchers to cover the window holes in their living quarters at a time when glass was non-existent or too expensive. In the 17th century some people started to add wooden shutters on the inside of these windows (see photo below at Annaghdown Castle) that could be operated from indoors. Mind you, they reduced the drafts, but did not stop them. What do you think the outside finish of these castles was like in medieval times, cut-stone or plastered? Take a guess, then check the answer clicking the link above. Have you ever thought about how they got doors to open and shut in medieval times? Find out how it worked! Battlements- the pretty ‘up and down’ stone structure around the castle roof, see it below. It wasn’t for decoration. Battlements aided the defensive capacity of the castle. They were a place for a guard, a place to shoot from with crossbows, later muskets and guns, as well as a place to throw rocks from as well as hot liquids. Look out for the gaps left for this purpose at the bottom of the battlements, which were called machicolations. 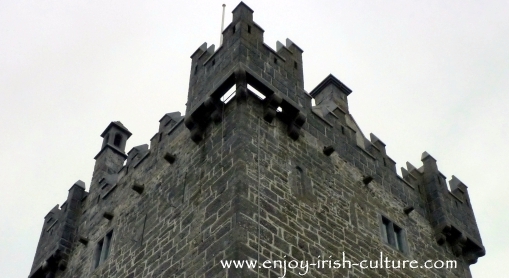 See a different type of battlements here at Claregalway Castle. 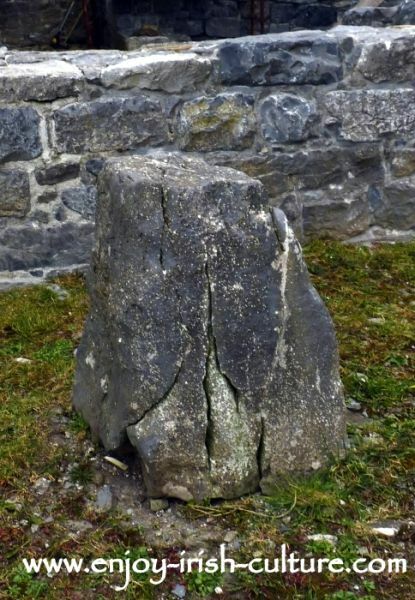 The mounting stone at Annaghdown Castle- very simply, a stone of the right height to help you mount your horse. You step on the mounting stone, then raise one leg and swing it over the horse. Check it out below. Mounting in style! The bawn wall- as seen on the photo below, a tall wall around the castle grounds, an additional defensive structure. The bawn- the area inside the castle wall with buildings housing people and livestock. You might find a blacksmiths’ headquarters here, maybe a saddle maker or other trades people considered crucial on the particular estate. Stables would be located inside the bawn, probably grain stores as well. Medieval tower house castles of Ireland had a bawn wall as seen here. If you enjoyed this article on caste vocabulary, please pay it back. Give us a social shout out using any of the sets of features on this website, the social buttons at the top left above the navigation, the social sharing boxes bottom of the page, or the Facebook comment box below.